A small line of decisions turned into the big change that is the website name change. The Beloved Fern has not only changed from being a DIY, cooking, lifestyle, blog to be only about the van, life in the van, and the places we go but it has also now changed to Filmore The Van. Same author, same family, same van, new content, new blog name. I hope you enjoy the little changes we have made at filmorethevan.com! Welcome to Filmore The Van! We are Rebecca, Ben, Arrow, and Filmore! This is our space to share our thoughts on a variety of topics centered around living a healthy and creative life as we build and explore in a converted sprinter van (Filmore)! What does that mean? There will be travel posts for the places we visit, what we recommend seeing, doing, and eating in those places, and how van life friendly that area is. We will also have other van life articles, posts on how we live in a van, our experiences in the van, how our life is different from apartment living, and being part of a community and keeping connected with friends and family while traveling full-time. 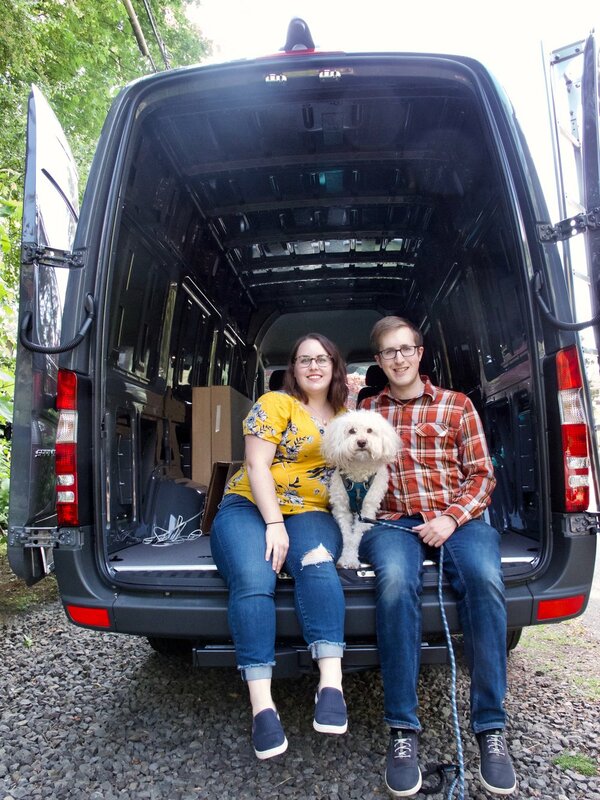 Of course, we show you how we built out our van and we’ll share the challenges we encountered and decisions we made along the way (in the Van Build tab). And there will be plenty of puppy photos along the way. I consider myself an Oregonian and have lived here over half my life, though I have longed to move somewhere else for a while now not because I dislike Oregon or Portland (I love both) but for the adventure and opportunity to try something new (we almost moved to Philadelphia last year). I love to travel; I lived in Salzburg, Austria for a year in college and had the opportunity to visit a lot of cool European cities and landscapes and I’m craving more trips abroad. In the last couple of years I have been able to see more of the US though, which I have enjoyed immensely, and the next few years in our sprinter van will be an amazing chance to explore more national parks and new cities full-time. I come from a long line of creatives, so it’s in my blood. The crafts I do regularly are quilting, card making, bullet journaling, and DIYing, though I plan on probably only bringing supplies to bullet journal, knit, and watercolor in the van (for now at least!). I love paddle boarding on a cool lake in the heat of summer, sitting in the sun with a book (or just for a nap! ), and the color dark green. Ben and I met in 2012, adopted Arrow in 2014, and married in 2016. As we fell in love, we discovered that we share a love of backgammon, a thirst for travel, and a desire to leave this world better than we found it. Ben is constantly making me laugh, confusing me with tech talk, and causing trouble by disrupting my organizational systems. A Minnesota native, I have lived in Maine, Vermont, Minnesota, British Columbia, Washington, and Oregon. Growing up in Duluth, Minnesota I learned to love adventure and exploring from a young age. Summers as a kid meant canoeing up in the Boundary Waters of northern Minnesota or sailing in the Duluth harbor. I spent three years of high school at the Putney School (in Vermont), where I had early mornings in the cow barn and the ability to explore 500 acres of forest plus sections of Vermont and Maine. My junior year was in Courtenay, British Columbia where I participated in the Explore program, taking accelerated classes to allow for kayaking and hiking trips. 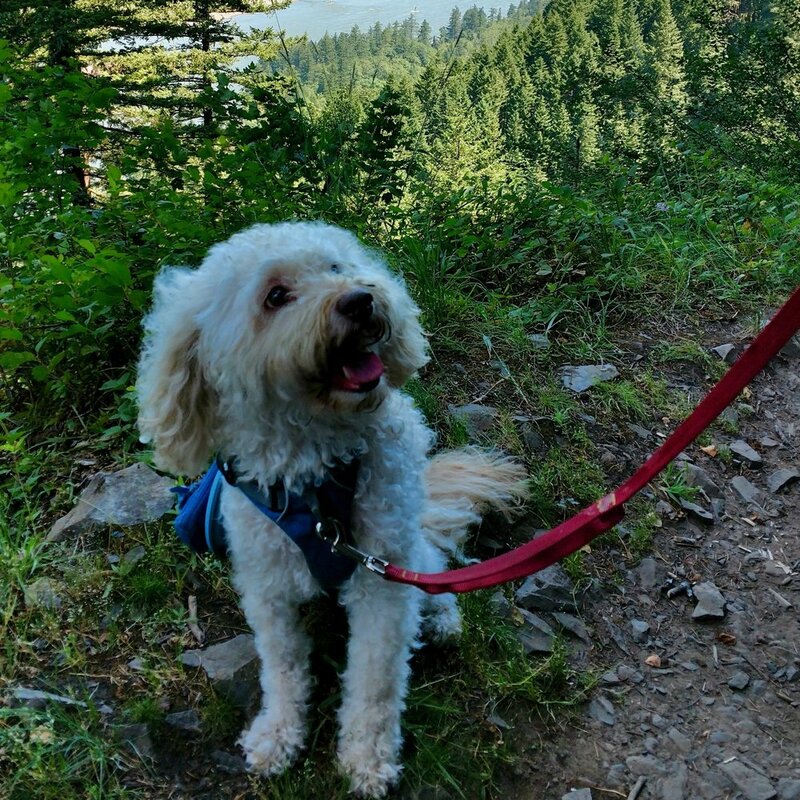 I am a gloriously fluffy mini poodle mix (though I have heard the term mutt used as well, is that a good thing?) with the most magnificent tail in all the lands (in my humble opinion). I rescued my mom and dad as they were aimlessly wandering the dangerous halls of the Oregon Humane Society and saved them from soul crushing loneliness and a life without snuggles. With my mom and dad, I spend most days on the snuggling cushions (which they call laps?) and protecting them from miscreants on walks (my loud deep bark belies my size). Nights are spent keeping their furless bodies warm and snuggled in bed. Nicknames I go by include fluffball, fluffy, baby, Monsieur LeFluff, Arrow LeFluff Bahrman (but only when I’m in trouble, which NEVER happens), and Sir Licks-A-Lot. I love car rides because it means my humans can’t move and I get to feel the wind blowing through my hair. My best friend is hedgy (my stuffed hedgehog), I can outswim my mom and dad any day, and if I spot you and your furry friend, I will bark endlessly to greet you (I want to make everyone feel important). I’m the newest member of the family. Born in Germany I rode a ship over to the US, after a bunch of people checked me over I started the journey to Oregon. I was happy to learn midway through my cross country trip that I already had a family waiting for me. I’m known as a Mercedes Sprinter 2500 in the 170” wheelbase (WB) size. That means I don’t have the dual set of rear wheels like some of my cousins, and my rear wheels are 170” behind my front wheels (my rear extends further back though). The only bigger version of my species is the 170” WB extended. Those cousins have an extra 15” in the rear behind the rear wheel. I’m looking forward to all the adventures my new family wants to take me on.